The UC’s efforts to shift its relationship with Elsevier will have implications beyond our University. Indeed, it is part of a global movement to break down paywalls for scholarly journals and to create a more open system of sharing knowledge, facilitating research, and enabling greater global equity of access to knowledge. Much of the action to date has been in Europe, but North American institutions, which represent 42% of Elsevier’s revenue, need to get involved. Because the UC accounts for nearly 10% of all US publishing output and has sizable subscription contracts, we are in a position to lead towards a more open and sustainable scholarly publishing ecosystem. The most recent issue of Science features an analysis of the intersection of governmental legislation and scientific inquiry, providing also a brief synopsis of accountability in “science bureaucracies” in the US. To ignore attempts by politically elected and appointed individuals to dictate how science should be conducted is to betray the very essence of science. Wagner, W., Fisher, E., & Pascual P. (2018). Whose science? A new era in regulatory “science wars.” Science 09 Nov 2018: 636-639. 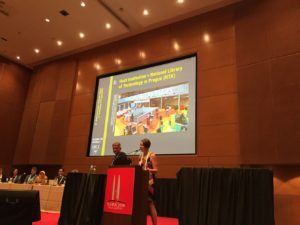 Just for the record, here are the official Science Europe pages for Plan S.
The NTK team was in Kuala Lumpur, Malaysia, to introduce the IFLA resource sharing community to Prague, site of the 16th IFLA ILDS Conference, 9-11 October, 2019. Details about the conference will be announced shortly and will be made available on the conference website. There are dozens of open science experiments to overcome the rigidities of scientific communication imposed by large international publishers and companies that produce citation indices. A small community could easily cooperate to take some of these paths, instead of shutting themselves in the blockhouse to defend the citation indices of their journals in national and international rankings. This event could also be an opportunity for the small scientific community of historians of economic thought to take a firm stand against evaluation practices based on the ranking of journals. My colleague Alena, as promised, attended the recent Anywhere Access (AA) webinar. AA aims to become “as fast as Sci-Hub” and to streamline the search-to-PDF workflow for researchers. Marketing heavily to researchers directly, AA aims to lock libraries in to purchasing subscriptions for its service (see this comparison of its features with other discovery mechanisms). For well-funded institutions, getting on board is perhaps a no brainer, providing its functionality lives up to the hype. But many of us in the library community worry about the accessibility of such tools to institutions without the funds to purchase them in terms of making more pressure on libraries to provide such services – pressure on institutions which may already be falling behind the wealthy institutions because of budgetary pressures due to subscription journal increases and other factors, expanding the effects of the digital divide. What would stop people in such cases from continuing to use P2P servers to access content their libraries cannot purchase or which are not available via open access? I cannot imagine that, in these cases, such libraries will be able to “disrupt the disrupters,” as promoted in the webinar follow-up email. AA will need critical subscription mass. It can also mean, for wealthy institutions, that once the “lock” happens, subscription to the tool becomes difficult to discontinue in the future. And if there are only one or two good players in this space (and not a fully competitive marketplace, as currently appears to be the case), this always opens up the door to steep future fee increases and, at some point, threats to a long-term funding model, on the library side. But of course, the end users might not care about such worries. Should they? I am concerned about what I will call ‘lock out.’ As some librarians are concerned about their faculty, students, and institutions being ‘locked in’ to one particular publisher’s services, I am concerned about society and small publishers being ‘locked out’ of critical technology services. Many of us on the Atypon platform were varying degrees of concerned about the sale to Wiley. The concerns were entirely about a publisher owning the platform that housed the content of many other publishers. We are faced with the same situation now that Elsevier has bought Aries Systems. A publisher that competes with many of Aries Systems’ customers, now owns the submission and production system used by these publishers. For some of us, like my organization (American Society of Civil Engineers), it’s a double-whammy. Our platform with all of its content and user data is owned by Wiley. Our submission system with all of our author and editorial data is owned by Elsevier. An increasing number of researchers are sharing their grant proposals openly. They do this to open up science so that all stages of the process can benefit from better interaction and communication and to provide examples for early career scientists writing grants.